Look for new English version of ZOND site!!! VES-IP DC data, interpretation software. Movie. New ! 8 stations free! VES-IP AC data interpretation and visualisation software. Cole-Cole model of polarization. New ! 8 stations free! 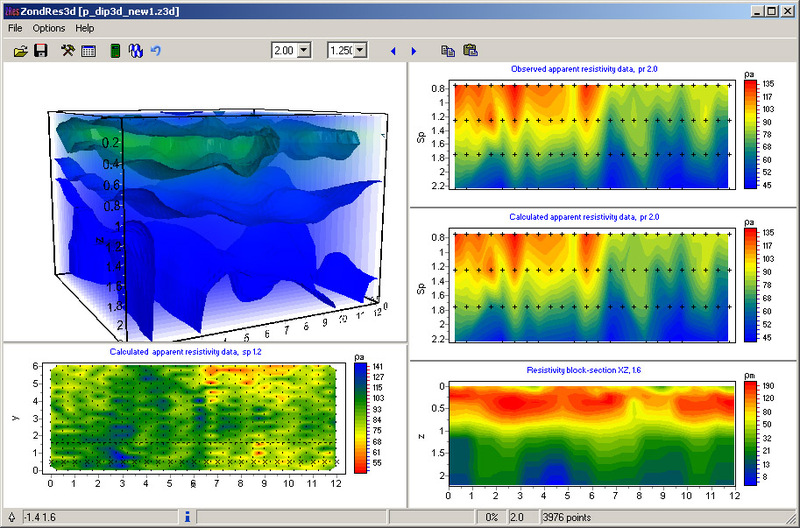 Time domain data interpretation and visualisation software. Any configurations(Loops/Lines) . New ! 8 stations free! Magnetotelluric data interpretation and visualisation software. Movie. New ! 8 stations free! Vertical magnetic dipole data in frequency domain interpretation and visualisation software. New ! 8 stations free! Software for visualization and printing interpretations results. 2D gravity and magnetic forward modeling and inversion. 2D MT forward modeling and inversion. 2.5D DC IP forward modeling and inversion. Movie. 2D Self-Potential forward modeling and inversion. 2D gravity and magnetic polygonal forward modeling. Movie. 3D DC IP forward modeling and inversion. 2D to 3D format converter. Visualization of 2d resistivity model in 3d.Movie. Windows driver for USB key. ERA-MultiMAX data gathering system. ERA-Multimax description.